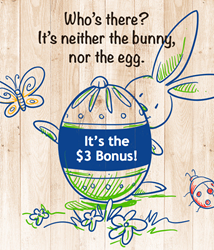 Easter comes with $3 Voice Credit bonus on TawagPinas.com! The offer is available between March 22-24. The promotion is valid between 22-24 March. Easter is just around the corner and TawagPinas.com has prepared a special gift for Pinoy all over the world: $3 Voice Credit bonus. The days of celebration to come wouldn’t be complete without calling family and friends, so TawagPinas.com helps Filipinos make longer calls to their loved ones, wherever they may be. TawagPinas.com customers are invited to get their gift by placing a Voice Credit order of minimum $20 and using coupon EAST3R16 in the ordering process. The promotion is valid between 22-24 March. Voice Credit is a prepaid service offering affordable credit for international calls and SMS. Customers can reach the Philippines at 9.9¢/min for landlines and 13.9¢/min for mobiles, while the cost of an SMS is 12¢. Besides Voice Credit, TawagPinas.com also offers Mobile Recharge, a service through which customers can recharge phones anywhere in the world in less than a minute and in a 100% secure environment.The operators available for top ups to the Philippines are Smart, Sun Telecom, and Globe. By following TawagPinas.com’s Facebook page (https://www.facebook.com/TawagPinas), customers will stay up to date with all the company’s offers and latest news. TawagPinas.com is an interactive website designed by KeepCalling, a global telecommunications company registered in 2002 in USA. Presently, KeepCalling provides its services to hundreds of thousands of consumers and businesses, with a focus on customer satisfaction. KeepCalling has been listed by Inc 5000 as one of the fastest growing companies in the USA for 5 consecutive years. In 2015 the company registered a revenue increase of over 200% from 2011 to 2014.